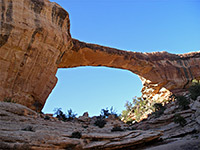 Natural Bridges National Monument covers a relatively small area in southeast Utah, close to scenic highway UT 95 between Hanksville and Blanding. 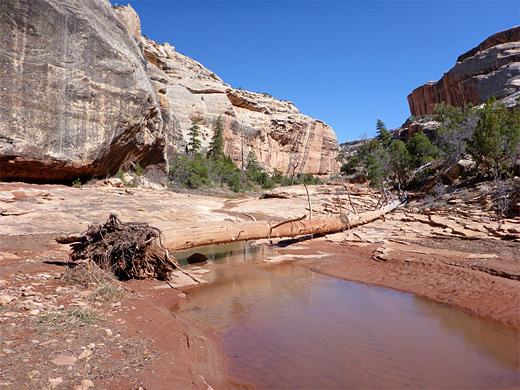 It is rather remote and not close to other parks so is not heavily visited, despite being near many fine, lesser known places in this part of the state such as White Canyon, Cedar Mesa, Grand Gulch Plateau and the La Sal Mountains. 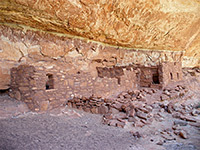 Unlike Arches National Park, with over 2,000 classified arches, there are only three bridges here though the monument also contains Anasazi cliff dwellings, pictographs and white sandstone canyons. 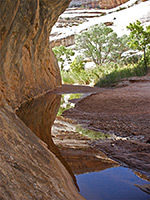 Natural bridges are formed by running water and hence are much rarer than arches, which result from a variety of other erosional forces. This is also the reason why bridges tend to be found within deep canyons, sometimes quite hidden, whereas arches are usually high and exposed, often the last remnants of cliffs and ridges. The bridges are reached by UT 275, a 4 mile side road forking off UT 95 close to the junction with UT 261 from Mexican Hat. The closest major town is Blanding, 38 miles east. Like all roads in this area, highway 275 crosses a flat, pinyon-juniper covered plateau around 6,500 feet in elevation - the top of the white Cedar Mesa sandstone layer - and bordered in most directions by distant red cliffs. The monument has a small visitor center, friendly staff and a well stocked bookshop. Drinking water is available, and the outside the center is a nice collection of desert plants native to this region. Just beyond is the NPS campground (13 units; no hook-ups), which is a popular place to stay though the land hereabouts has many good sites for free camping, along side tracks away from the main roads. A more modern attraction of the park is the Photovoltaic Array, one of the largest solar power generators in the world, which may be viewed by a short trail starting near the visitor center. The park road divides just after the campground, at start of a narrow, 9 mile, one-way loop that passes various viewpoints, trailheads and picnic areas (see map). The loop road (Bridge View Drive) has several overlooks of the three bridges, currently known as Sipapu, Kachina and Owachomo after their original names were changed to reflect the Hopi Indian history of the area. The last of these three is the most spectacular when seen from the road, and also the easiest to hike to - the path into the canyon underneath the bridge is only a few hundred yards. It is the oldest bridge in the park, and rock falls have reduced the thickness to only 9 feet, so it may not be here much longer. Needless to say, walking on top of the bridges is not allowed, though this would generally be difficult as the surrounding cliffs are tall and steep. Kachina Bridge is the most geologically recent of the three and is still being actively enlarged - 4,000 tons of rock fell from the north side in June 1992 - unlike the others which are now situated some way above the watercourses, however Kachina is difficult to spot from the highway, and requires the longest walk to reach. Although also quite far from the road, the first bridge (Sipapu) is in full view from the overlook, and presents an easily recognizable outline. 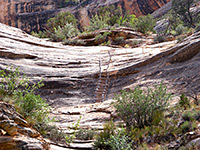 Short, well-used trails lead from the loop road to the bridges, and a moderately difficult, unmaintained, 5 mile path connects all three, following the path of the two canyons (Armstrong and White), formed by the seasonal streams responsible for the bridge formation. 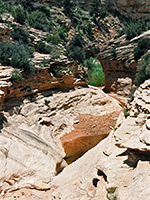 Although the canyons are usually dry during the summer, at other times the trail passes small waterfalls and deep pools, sometimes suitable for swimming. The three trailheads are also linked by paths across the plateau, enabling loop hikes to be made to any two of the bridges, or all of them. 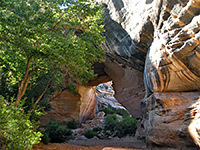 The only other regular path in the park is a short, level route to an overlook of Horse Collar Ruin, remains of an Anasazi cliff dwelling, a site that is passed along the canyon trail half a mile south of Sipapu Bridge. There is one additional path, rarely traveled, that links the southernmost bridge (Owachomo) with highway 95 - this climbs the far side of Armstrong Canyon then crosses a bushy plateau for 2 miles to the main road. This was once the main entrance to the national monument, prior to construction of the current access road. 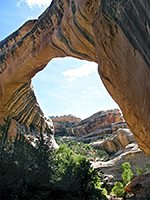 The nearest town with hotels close to Natural Bridges National Monument is Blanding (38 miles).